Experts say that thousands of people are injured in roof crush traffic accidents each year in the United States. If you or a loved one have been involved in this type of auto accident, it’s important to understand your right to compensation. Roof crush occurs during a collision that causes the vehicle to roll over. When a car is flipped upside down due to a crash, the full weight of the vehicle presses on the roof. If the roof supports and roll bars aren’t strong enough, the roof may collapse and cause the mass of the vehicle to fall on the driver and any passengers. Roof crush can also cause the vehicle’s windshield and side windows to break. If occupants aren’t wearing seatbelts, they may be thrown from the vehicle. Sometimes, a roof crush accident only involves the roof buckling under the force of the collision. However, this is still a serious problem. Buckling limits the headroom available, which dramatically increases the risk of head and neck injuries. Additionally, buckling can cause problems with the effectiveness of the vehicle’s airbags and seatbelts. Studies have shown that trucks, vans, and SUVs have the highest rates of roof crush injuries. This is because these types of vehicles have a higher center of gravity, which leaves them more vulnerable to rollover accidents. 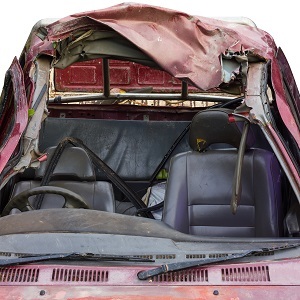 The age of a vehicle also affects the risk of roof crush in a rollover accident. US law requires vehicles manufactured after 1973 to withstand at least 1.5 times their weight. However, a 2009 law increased this requirement to require that vehicles handle at least three times their own weight by 2017. This means newer vehicles are less likely to be involved in roof crush accidents. These injuries often result in a lengthy recovery time and permanent disability, and they require ongoing medical care. Depending upon the extent of their injuries, victims may no longer be able to work or live independently. In the most serious cases, roof crush injuries can be fatal. In an auto accident, the at-fault driver is typically responsible for the damages that result. If both drivers are partially at fault, settlements are proportionally reduced to reflect liability. However, roof crush accidents can complicate matters because a vehicle design flaw may be the reason for the roof crush. When a design flaw causes the roof to crush, you are entitled to pursue a claim against the vehicle manufacturer. Louisiana’s personal injury law is complex and victims typically have only one year to file a claim for damages. To protect your rights, it’s best to hire an experienced attorney who can establish liability, document damages, locate relevant expert witnesses, and negotiate with the insurance company on your behalf.